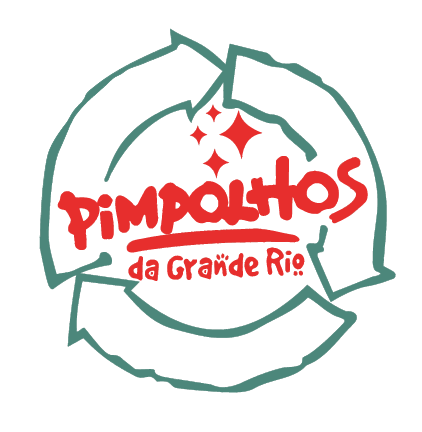 We are the Pimpolhos of Grande Rio, a Youth Samba School and Non-Governmental Organization, our aim is to promote social inclusion and educate through art, culture and carnival. We are from Duque de Caxias, Rio de Janeiro state, and we’ve performed, since 2003, an important job along with the local communities. In partnership with companies in the region, we have developed several artistic and cultural activities, creating learning and growing opportunities for hundreds of children and teenagers. We believe that art is a powerful vehicle of social transformation. For this reason, we work hard to raise awareness allied with ludic-pedagogic activities from our Samba School platform, opening space for debates and reflections. The importance of reuse and the conscious use of materials it is also key to our creative process, our activities are developed upon core values for the training of the youth and their families, as respect for the environment, collaboration and the team spirit. Today, we carry out education and training projects in order to create mechanisms of self-sustainability for our School, professionalizing our youth and adults, to bring them back to the cultural market. Promote social interaction and educate through art, culture and carnival, creating learning and growing opportunities for hundreds of children and teenagers. Be a self-sustaining NGO and reference in art education that promotes social inclusion, educational and professional development of kids and teens, bringing knowledge to several layers of society on key issues such as: environment, citizenship, health and culture. Every year, we took about 1,000 children and teenagers to the avenue for a carnival parade in the Marques de Sapucaí, with educational storylines and a lot of joy! Created in 2005, the Carnival School platform is a space for research, reflection, production and enhancement of the carnival culture. They are offered courses, workshops, visitation to expositions and cultural spaces, exchanges with carnival professionals and the entertainment market, connections with learning institutions and other activities to enrich the repertoire of those involved in the project. We invite you to an unforgettable experience backstage of the Rio Carnival. A time travel through the historic streets of Little Africa – to the samba’s crib – then to the Carnival Factory. Tours, workshops, shows and much more!